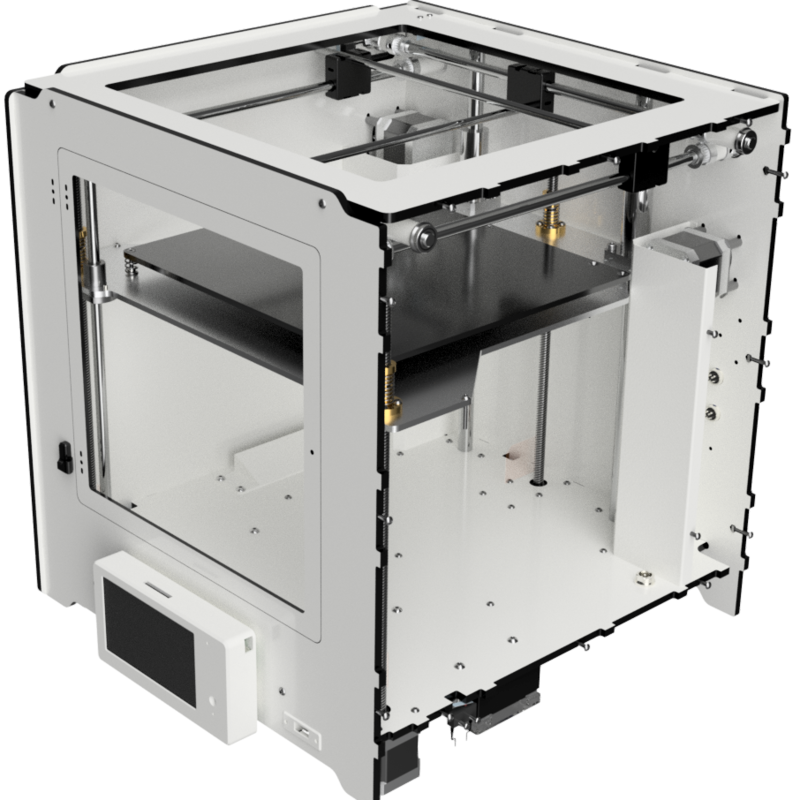 In this post I’ll start describing what is needed to actually build the xBot-Medium printer. I’ve set up a xBot-Medium Github Repository where the files can be found for this project. As I havn’t finished it yet, all the files aren’t there, but they will be! Only the .STP files for the Dibond frame pieces and some a few for printed parts are missing, so it’s pretty much complete allready. This post is going to be about the custom parts we need for the xBot-Medium 3D Printer. I’ll list the Electronics and Electrical and Mechanical parts in a later post. 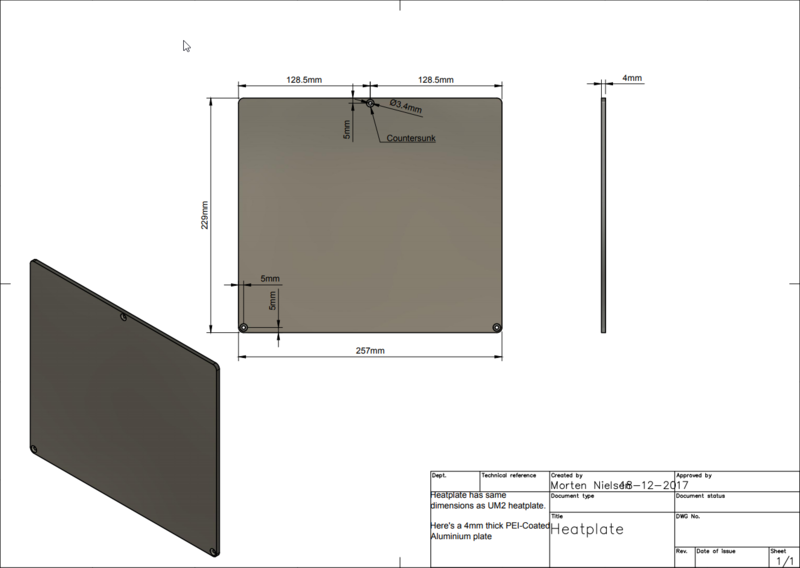 The frame for the xBot Medium is made out of 6 pieces of Dibond pieces. We actually have 8 pieces when counting the Front Door and the Rear Z-Rod Cover, but these two are part of the Top and Front Dibond pieces respectively, as you’ll see here. Most items of interested are noted on the piece. I’ve intended one the two GX16 to the left to be for the Wire harness for the Carriage. The other one for BLTouch or other sensor. The four GX12 4-pin, two to either side, are meant for Belted Extruder v4. Above the GX12 holes to the right are cut outs meant for a Titan Extruder or similar, which people can finish on their own if needed. USB cutout is meant for a Panel Mount USB B Female socket to USB Micro B 5 pin male cable. Ie, giving you USB access to the board from the rear of the printer. The bottom accomodates a host of cutouts to accomadte our various pieces of machinery and electrical stuff to make our printer. The mountholes for powersupply is based on Meanwell HPR-450-24 which is a quality 18.8a low profile supply with temperature controlled fans, so it shouldn’t make unduly noise. Aside from this, you’ll find cutout for 14×3.2cm Chamber heater and mountholes for SSR for the heated bed and of course for our Duet WiFi and Duex expansionboard. I’ve designed special 3D printable mount parts for the controllers, which incorporates fixpoints for box/shield/fans or similar for the controller. Lastly we have room for our 3x Z 280mm motors various Z rods and the Optional 3x Z-Max endstops. The front piece contains the Rear Z-rod Cover and the various mountpoints for the door. At the lower part there are optional cutouts for a front facing USB for power, but an adapter for the rear USB panel mount could also be mounted here. We also have room for a manual rocker switch to turn LED on/off. Finally there are 2 holes for m3 screws placed 80mm apart to facilitate mounting of an LCD panel if you use one. Left panel contains mount points for the Y-Max endstop and a groove for wires from both the Y and X endstop. We also have mount holes for our Left Motorshield and holes for the optional front left Z-max endstop. And of course the motor driving the Y axis. Right panel is the most simple panel of all. It contains the mountholes for the optional front right Z-Max limit stop and holes to fix the Right Motor Shield in place as well. The top piece has the Door inserted into the empty space. I’ll strongly encourage to have the door made as it greatly improves all prints you make regardless of material. Even PLA benefits a lot from an enclosed room with a steady slightly raised temperature. Aside from the Door, the Top contains mount holes for the X-Min endstop and holes for both the 2x 12mm Z rods and the 2x 8mm Z rods. Next up is our list of 6, 8 and 12mm steel rods. I know it’s tempting to buy some cheap chinese bundle of “chromed steel rods”, but please don’t. They are most often not straight and the tolerance is also off by default. My impression: it seems they take normal 8mm steel rods and do a put a “coat” of chrome on it, making it neither precise nor particularily durable. My description on how they do it, might be totally wrong, but it’s the impression I have from many bad purchases for rods. So, go shop at a place where they guarantee a certain qiality standard, namely h6. It’s a standard for tolerances and deviations allowed and such. It’s especially important with tight tolerances as we are using bushings for our X and Y rods and sometimes the cheap chinese rods are simply “too fat” for the bushings to pass over.. conversely it’s no good if the rods are too thin either, or not straight. I’ve allmost always had problems getting the cheap rods through the flanged bearings we use at the XY ends as well. I’ve ordered all my rods from Dold-Mechatronik this time around and I must say the quality is truely impressive! The tolerance is 9um (micrometer) which means accuracy within 0.009mm. In other words these rods are high quality steel rods, ground and polished with a superb finish! 2x X-rods 8mm in diameter. Each of them 367mm long. They run from side to side. The two front 8mm rods for Z axis. 339mm long. Runs near each front z motor. The two 12mm diameter and 339mm long rear Z-rods. Placed on either side of the center rear Z-motor. A single 6mm diameter 301mm long rod running from front to back for our carriage. Next up is a few pieces we need to have custom made as well. The most important parts are the 4x steel pieces used to keep the four Z rods in place. The Motorshields are not just for show though, but are intended to partially keep out the heat from the heated chamber while keeping the XY motors cooler using a temperature controlled 40mm fan under each motor. Doing this as the motors performs best and last longer if we can keep their temperature under 40c. I’ll most likely design some printed versions of these. Left motorshield. There is room for 48mm long motors making it possible to use quality 0.9 steps Nema 17 motors! 2 m3 threaded holes in each side of the shield for fastening onto the frame in addition to two spuds at the bottom for fastening onto the Bottom frame part. Right motorshield. There is room for 48mm long motors making it possible to use quality 0.9 steps Nema 17 motors! 2 pieces of 2mm thick steel plates to hold the 8mm Z-rods in place. There is a m3 threaded hole in each end of the plates to keep them in place. 2 pieces of 2mm thick steel plates to hold the 12mm Z-rods in place. There is a m3 threaded hole in each end of the plates to keep them in place. 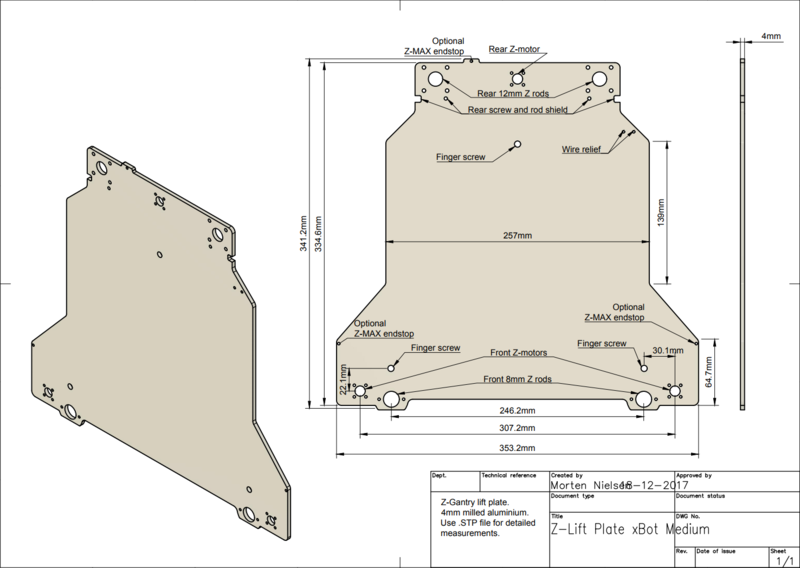 We have 2 custom aluminium parts we need to make for the Z-stage. The Heated bed and the Z-liftplate. You can use a heated bed from Ultimaker 2 if you choose, but I personally strongly prefer the option with 4-5mm aluminiumplate and an AC under it. I’m using a PEI-coated 5mm thick aluminium plate from clever3d.de with a 500W AC Keenovo silicone heater under. I’m recommending using an AC/mains heater, as you remove the stress from your PSU and electronics, meaning it’s easier to cool and you can do with a smaller PSU than you’d otherwise need or run your existing PSU without noisy fans. Note the temperature sensor sits in the middle of the pad and in my experience it shows about 10c more than the actual surface of the bed. At least for a good while.I havn’t shopped at Aluminiumwarehouse.co.uk but they have nice prices on their parts and their Ecocast plates would do perfectly for this as well. (choose CAST from dropdown menu. The Z-liftplate is a bit complicated due to the 3 motors, 4 support rods, 3 holes for screws to hit the Z-end stops and the 3 point Finger Screws to adjust the bed. I’ve not made cutouts to make it lighter or similar, as it’s mostly for show anyway, but also because the extra cutting takes more time and so costs more money to make. You can find all the source files in the xBot-Medium Github Repository. In the next post we will take a look at the Electronics and Electrical and Mechanical parts. Previous post: xBot Medium – A new printer is baking! Great project, can’t wait to start building my own version of your printer. An other question: why did you not use the CoreXY in this build as you did in your previous build? Is the Ultimaker version just the best way? I vastly prefer the UM way over CoreXY. Before and during my last printer project I was ensured CoreXY wouldn’t twist the carriage when changing direction. This was my main concern…. and yes, it does twist the carriage unless you have a wide very stiff/rigid square around the carriage structure (steel). UM is the opposite. It always pull equally at both sides and the springs ensures the correct tension and even a small measure of compensation. In this size machine I can’t see any advantages in CoreXY, but the UM way doesn’t scale that well as you have to upscale the rods if you make it larger. I can see CoreXY being out to good use in very large printers where space isn’t an issue. You can make some really rigid framework and use heavy direct extruders on it. I have now made several printers every time making them more aesthetic pleasing to the eye. I have now come across your Xbot. And boy o boy, i love the look of it. I really want to start sourcing the parts to build it but i can’t seem figure out where you had the dibond frame cut. I have searched for laser cutting firms but on their websites they won’t cut dibond as the result is not going to be good. Where did you have yours done ?